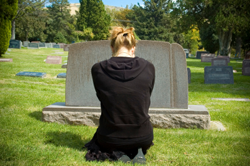 When we’ve lost someone we love, grief is a journey we can’t avoid. But that doesn’t stop many of us (particularly men) from trying. Perhaps we’re afraid that such intense emotions will overwhelm us. Or maybe we hope that if we pretend to be okay, that fantasy will somehow come true. While mourning the loss of my wife, intense waves of sadness would often crash down upon me, threatening to wash me away. A photograph, a song on the radio, a fragrance, a random thought… the triggers were everywhere. I wanted to shelter myself from these emotional tsunamis and I thought that keeping busy would do the trick. I took on extra work projects and sought whatever distractions I could find to fill whatever gaps were left after taking care of my daughters and assuming the housekeeping duties my wife used to handle. The problem with denying or avoiding grief is that it doesn’t work for long and ultimately backfires. Anyone who has ever seen a horror movie can tell you that when you bury something prematurely, it has a nasty way of coming back. And when it does, it’s usually a lot uglier and does a lot more damage. Burying our emotions has the same result. Finally, after a three-month, nonstop frenzy of activity, I stopped and took a look around. The landscape hadn’t changed. Julie was still gone, I was still alone, and my prospects for the future were no brighter. I may have delayed some pain, but I hadn’t avoided any. To make things worse, overwork combined with loneliness began causing some emotional stress fractures. I found myself growing irritable and impatient, consistently over-reacting to relatively minor annoyances. The unavoidable truth is that sooner or later, the sickness inside us needs to come out, whether it is physical or emotional. So, I let the tears come. And boy, did they come! There were lots of times that life would come to a sudden stop while I sobbed until I nearly couldn’t breathe. I did more crying in that first year than in the rest of my life all put together. At one point, my daughter actually accused me of going out of my way to make myself feel sad. But I wasn’t hunting for more hurt; I simply wasn’t hiding from it anymore. I didn’t like the fact that there were movies I couldn’t see, places I couldn’t go, songs I couldn’t listen to and memories I couldn’t think about without breaking down. And I knew that the only way to get those things back was to set my emotions free and deal with them as they came along. Eventually, I learned not only to endure the pain, but to embrace it as an indispensable part of the healing process. I still cry sometimes; I probably always will. But now I can treasure all the experiences and all the memories we shared without being totally devastated. What a reward! Granted, the journey through grief is miserable. But until we complete it, we’re not going anywhere. Your story is sad and we all will go through that one dya when we loose someone special. Only you know what you have been through and what the journey through grief looks like. At the same time you have learnt to live through her memories and that is perhaps the best thing to do. I just lost my oldest and dearest friend. My touchstone. Of 30 years. For a really stupid reason. It is the little things that get you. A smell, a song, something we shared in our youth. We can only continue living.